For the first time in more than five years, there’s a new undisputed ONE bantamweight champion after Kevin Belingon eked out a split decision victory over Bibiano Fernandes in the main event at ONE: ‘Heart of the Lion’. 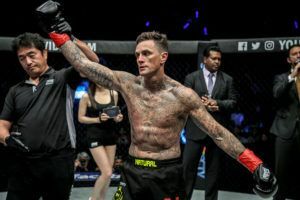 Fernandes was the longest reigning champion in ONE Championship history but Belingon managed to pull off the massive upset, albeit by way of a debatable decision, after five rounds in Singapore. 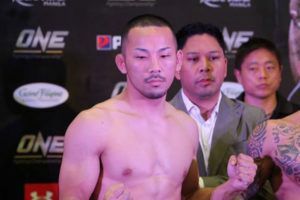 Fernandes had previously dispatched Belingon with a first round kimura when they met in 2016 but the bantamweight champion knew he had a fight on his hands when the rematch got underway on Friday in Singapore. Belingon was fast on his feet and explosive with his striking combinations, showing a ton of confidence in the early going. The second round saw Fernandes grab onto an armbar and it appeared he might get the finish but Belingon continued to twist and turn before escaping. Finding himself in top position the Filipino began to attack with ground and pound, with the champion grateful to hear the bell. It was Fernandes who finished strongly in the third round after he took Belingon down, moved into the mount and began raining down with punches in bunches. This time it was the Filipino who would have been grateful to reach the end of the round. 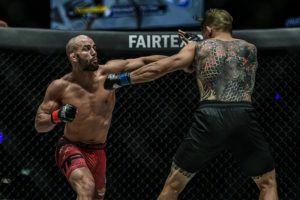 As the fourth round got underway, Fernandes appeared to be in control as he once again secured the takedown and then immediately began his ground assault. Fernandes nearly locked up another submission but Belingon’s defense was much improved from their first meeting and he was able to slip free again. With less than a minute to go, Belingon fired a perfectly timed straight punch down the middle and it landed flush as Fernandes stumbled backwards towards the mat. The bantamweight champion was quick to bounce back to his feet but Belingon definitely had him hurt in those waning seconds. 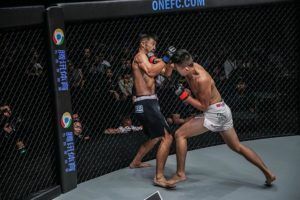 Belingon continued to move forward with his striking combinations in the fifth and final around while looking to edge out the victory in a hard fought battle over 25 minutes. By the time the final bell sounded, Belingon and Fernandes looked like they had been through a war in an epic rematch to crown the undisputed champion. When it was over, the judges gave a split decision to Belingon (20-5), who handed Fernandes (22-4) his first loss in eight years while ending the reign of the longest reigning champion in ONE history. Considering the history shared between the two fighters as well as the somewhat controversial result in the rematch, it’s tough to imagine a scenario that doesn’t end with a trilogy between Fernandes and Belingon. In the co-main event, 20-year old Christian Lee (10-3) made short work of UFC veteran Kazuki Tokudome (18-10-1) with a first round finish in a fight which was put together on just five day’s notice. 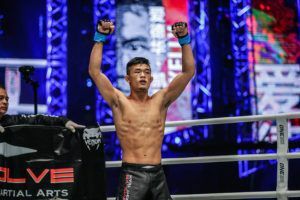 Lee took the fight after his sister Angela Lee was forced out of the main event on the card and her bout against strawweight champion Xiong Jing Nan was scrapped. Despite having little time to prepare for the fight, Lee came out like a ball of fire looking to light Tokudome up with strikes while also digging for the takedown. Tokudome was able to survive the early flurry before securing a takedown of his own but the judo expert was unable to keep Lee on the ground for very long. Once he was back on the feet, Lee was on the attack and he landed his best strike of the fight with a blistering straight right that blasted Tokudome on the jaw and immediately buckled his legs. 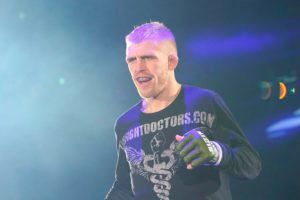 Lee quickly followed up with a takedown, transitioned to take the back and then just blasted away with punches until he earned the TKO stoppage at 3:07 in the first round. 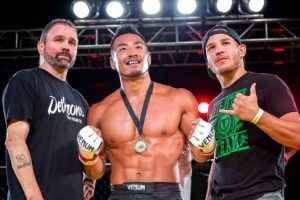 Afterwards, Lee turned his attention to Jadamba Narantungalag in hopes of setting up an interim featherweight title fight with reigning champion Martin Nguyen sidelined currently with an injury. “I’m hoping for an interim title match with him soon for the featherweight belt,” Lee said to the raucous Singapore crowd. 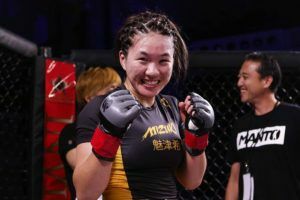 Local favorite Tiffany Teo (8-1) was able to use a strong kickboxing attack to negate the ground game of multi-time Brazilian jiu-jitsu champion Michelle Nicolini (5-2). While Nicolini did manage a couple of takedowns in the fight — and securing a near finish in the second round with a very slick armbar submission — she just wasn’t able to put the fight away. That submission attempt was definitely her best chance to win as Teo began blasting away at her legs with a series of nasty kicks in the third and final round. Teo’s confidence grew with every exchange as Nicolini’s gas tank was drained as she became a stationary target as time ticked away. With Teo continuing her offensive barrage, Nicolini was constantly reaching down to stop the leg kicks, just inviting shots to get launched at her head but she managed to survive to the final bell. When it was all over, Teo celebrated with the Singapore crowd as she earned the unanimous decision victory. 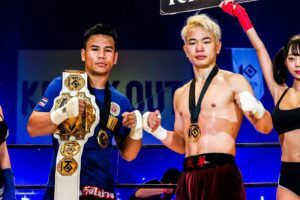 Following four straight losses, Adrian Pang (23-12-2) bounced back with an impressive TKO victory against Kota Shimoishi (21-7) in lightweight action on the card. 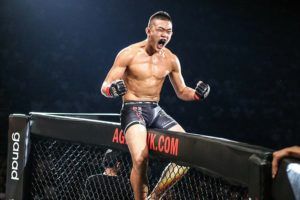 While Shimioishi was able to secure the takedown to negate Pang’s power on the feet, he couldn’t prevent a series of blistering elbows and hammer fists to tag him from the bottom in a relentless attack from the Australian based fighter. The elbows opened up a deep cut above the Japanese fighter’s right eye. At the end of the round both men returned to the corners but the doctor quickly ruled that Shimoishi would be unable to continue. On the preliminary card, multi-time grappling champion Garry Tonon remained undefeated with another strong showing to move to 3-0 overall. Showing off his striking early, Tonon seemed more than comfortable exchange punches with Lee (2-3), who was hesitant to engage and wanted to avoid any chance the fight would hit the ground. 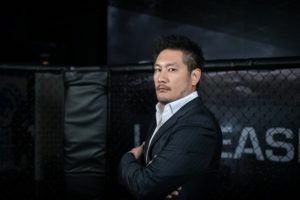 Despite Lee’s best efforts to keep the fight standing, Tonon got him down multiple times including a perfectly timed single leg takedown that put him on the mat in the second round and the South Korean featherweight wouldn’t get up again. Tonon quickly sliced through his defense, latched onto a guillotine choke and while he had to scramble through a couple of escape attempts, the BJJ black belt eventually secured the tap after moving to the mount and trapping Lee from moving any further. 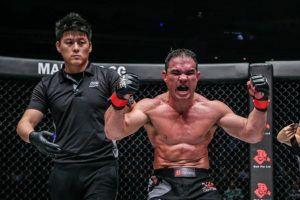 Tonon remains one of the best prospects in all of ONE Championship while putting on another dominant performance in his latest victory.